← Blogging Umineko Chiru EP 5 – 27 – The Isn’t Over Until It’s Over. The Game MUST Go On! It’s the day of the family conference one year before the 1986 family conference where Beatrice’s game takes place, Krauss’ siblings are on their way back to their homes and haven’t noticed that Kinzo is gone. Eva believes that Kinzo overheard them talking about the inheritance but in reality it was Kumasawa who tricked them. Natsuhi is pleased that everything went according to plan. She says that she’ll pay the servants extra for doing this favor. She tells them to keep up the good work. Natsuhi has a picnic celebrating this victory with Beatrice. At some point, Natsuhi mentions about the good times that she and Krauss had as newlyweds traveling around the world when Krauss still didn’t show her his stupidity. They have a really good time. Krauss has a great interest for the east unlike his father who enjoyed the west. She mentions how back then Krauss didn’t hide the obvious jealousy that he had towards Kinzo for being Natsuhi’s favorite. Based on the description of the latest trip they were in Natsuhi sounded damn moe, then it might be because I’ve always had a vivid imagination that I can perfectly picture it. People in charge of the family finances are here to fully explain to Natsuhi what situation they’re in. They show that Krauss’ projects are looking good but they’ll need more time to actually provide the money they need. Natsuhi reprehends her husband for not keeping his promise to get this mess all sort out after those 6 months. In the end, Natsuhi accepts this since Krauss has always screwed up his plans because he didn’t wait long enough many times. Wouldn’t it be crazy if Krauss was lying and his projects aren’t in the rise at all? Enough to make Natsuhi go crazy on him? Natsuhi is forced to ask for Kinzo’s help this year too and go with the new plan of him staying on his study the whole time with the excuse that he is in a bad mood and he is busy ‘studying’. Beatrice also assures her that she will also show her support this year too. What Natsuhi doesn’t know is the siblings are already suspecting something is up in that mansion and it’s probably not related to the theory that Kanon is Shannon. I mean really, people? Trollkastel shows up and interrupts the time Battler is havingwith his girlfriend the former Golden Witch now reduced to a pitiful doll-like creature. Battler easily denies that Natsuhi was having a conversation with someone after Bern asks him if he needs help handling the situation but soon shuts up when he notices that Beatrice is suffering because he is denying her existence. Trollkastel teaches Battler that this cat in the box claim he’s using won’t work on her like it did on Beato and declares in red that Natsuhi was all alone while drinking tea destroying all hope that Beato might there. Beatrice is hurt. 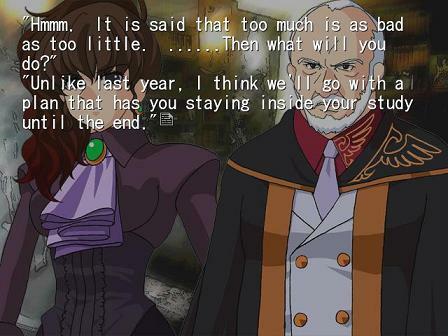 Bernkastel also lectures (as well as make fun) Battler for contradicting himself here by ‘going easy’ on Beatrice. She understands that Lambda has managed to control Battler’s emotions and knows that she’ll have to help him more often. Battler couldn’t care less about her and he’s also mad about the way how Trollkastel unnecessarily uses the red. After Bernkastel leaves Battler says statements in blue opening the possibility that even though Beatrice might not exist on 1986 she might’ve existed on 1985 or that a person by that name might’ve existed on Rokkenjima as Lambda never declared in red how many people were on that island on that day or year. Beato’s pain is reduced and she shows slightly that she is feeling a bit better. Battler has mix feelings about this game after seeing how much pain Beatrice is taking but ultimately understands that he must put an end to her pain as quick and as painless as he possible can. Lambdadelta sure is glad that someone with the title of keikaku doori is not her opponent. It was actually Hideyoshi who suspected that Kinzo might not be alive or that at least Krauss is hiding something from them. Hideyoshi? For real? Meanwhile, Rudolf is worried about their own financial situation and asks Kyrie what should be done about it. Both of them are planning to get money out of Krauss but Rudolf isn’t so sure how to do it since it’s obvious that Krauss is also in a terrible situation. Isn’t just me or the game is making Kyrie act ‘evil’ on purpose? I see that they’re making her one of the red-herring for EP 5. We’ll see if I see if more proof of this later. Later Rudolf contacts Rosa over phone tells her that they plan on having a meeting with only the three of them (Not Krauss) to discuss something crucial. Rosa knows that her brothers always come up with some plan and drag her into it so she doesn’t like this one bit but she cannot refuse when Rudolf tells her that this could clear everyone’s debts. Sadly, as it turns out that very day they’re meeting, Rosa had promised Maria to take her to a new amusement park. Rosa has to break the news to Maria who is happily playing with Sakutaro. Ok, now that broken promise was on the siblings. Also Sakutaro is still there.. just when exactly did this happen prior to the family conference? Back in Rokkenjima Genji informs Natsuhi that she has a phone call from someone who didn’t state his name. Although hesitant at first Natsuhi decides to take the call and be done with it because it may be related to the financial problems they’re having. As it turns out this phone call is something huge. After staying silent for few seconds the caller tells Natsuhi that he (she?) is her child from 19 years ago. The caller tells Natsuhi to remember her sin. Natsuhi is more than shock and she denies the possibility of her having a child beside Jessica. ‘He’ tells her that he is also coming to the family conference on that day to have his revenge. Natsuhi violently hangs up the phone like is a company is trying to sell her something she doesn’t need. We switched to Lambda and Bern and their yuri quality time. The two yuri witches and their mandatory yuristic monologues. Now I’m as certain that these two should have their own show as the fact the Lamdbadelta’s <favorite> page is<Lilicious>. Certainly! Doll-like Beato – even I’m staring to feel sorry for Beatrice. After seeing more proof that Beatrice can not escape this game makes the probability that this is all a huge lie be reduced in more than half. Is it really Ok to trust her? I-I-I-I-a-a-am n-n-n-not f-f-a-a-a-lli-ii-ing f-f-or it! Damn it Lambda is going to get me at this rate. Even if this isn’t a trick I’d be still playing into her hands by ‘going easy’ on Beato. Is there any other way? What if one of them messes up, huh? Kanon mentioned how clumsy Shannon is but I think that there is other person who could easily be the one who might have let the secret out. That’s right. Old Kumasawa might also be the one. Natsuhi told her many time not to talk so loudly. Is it possible that someone overheard her at some point prior or on that very day and found out that Kinzo is dead? In my opinion, the culprit seems to know (not just merely assume) that Kinzo is actually dead so maybe this is how he or she found about it? Awesome parents should stick together – so I’m assuming Hideyoshi told Eva and Eva told the others what they suspected so it was probably Kyrie who put the plan together for them. She probably handled all the little details alone on how to perfectly corner Krauss. That should explain why Eva and the other were so confused when Kyrie put the plan in motion in EP 3. This explains who started the whole ‘father is dead’ theory. Did none of the siblings already suspected this? I’d think that at least Kyrie suspected something was definitely up. So if their plan was to get money from Krauss and they knew Kinzo was dead then why did they need Beatrice? In past arcs Rosa, Maria and Kyrie are the only ones who ‘meet’ Beatrice at some point. Also Eva other side meets Beatrice after she finds the gold. What does this mean? Why did they lie about meeting a person who doesn’t exist when their plan is threaten by her very existence? I’ll have to keep this mind. Natsuhi talking to herself – Battler tells Bern that he only sees Natsuhi having a cup of tea all alone. Bernkastel says that he is right. ~because love is lacking, it cannot be seen, Battler says. This is the first time that a witch has accepted that what the player sees is a lie. I was actually shocked that she did that. It was something that was well known but I never expected any of them to come out and say it. Still, the acceptance that what we see is a lie brings other doubts to my mind. So Lambdadelta or the witch can control what one sees. Is it only related to ‘supernatural’ things or not? Also Bernkastel obviously does not have love for any of the Ushiromiya yet she was able to see right through the lie. She even used red like she knew for a fact Natsuhi was sitting there all alone. Do all witches have that power to see through these lies? What else can she see and what she can’t? The Phone Call – I found it a bit funny how ambiguous they were being here. I mean you can tell when someone is a boy or a girl by their voices then again we’re talking Japanese people and I’ve seen male characters voiced by females in anime so it kinda works out. Still I wish they’d said that it was definitely a guy. I have other mysteries to solve. But I’m sure this mysterious X will be the one getting on my way to solve this EP. Did Natsuhi make up that phone call? Was it her wild imagination that desperate wanted to create something that wasn’t there? I think the only way to corroborate that this phone call even happen is to question Genji but even then it’s not possible to know if what the person said was actually what we saw as Genji supposedly hung up the phone. Also is it possible to fake an external call? Is there any way that Natsuhi can know for a fact it was really something from outside the mansion? I cannot see Genji trying to imitate a young man’s voice but I can see Kanon doing it. I’m sure Natsuhi would recognize the voice of one of her servants though. Is it possible that one of the siblings found some dirt on her? 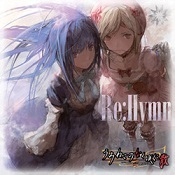 About the identity of this person – Ryukishi07 sure likes adding creepy phone calls in his projects. Based on the conversation they had the son tells Natsuhi that he couldn’t forget what she did to him 19 years ago so I’m guessing that this ‘young man’ is at least 24 years old to remember what she did to him. Why would Natsuhi not remember though? Also aren’t we forgetting that there are only supposed to be 17 people on Rokkenjima? If that person was present it wouldn’t be 17 people but 18 people again. Yes, the mysterious ‘X’ is back. Sons? – What’s with children in this game? In EP 4 (not in the anime) Sakutaro calls Rosa his mom which seriously creeped her out. This scene happens before the scene where Maria kills her over and over. I don’t blame Rosa for being confused though, a human-like creature that looks like a lion calling you his mom is plain strange even more after you just got killed by your own father. Is the game telling something or is it just a very creepy symbolism of some sort? There’s what I just mentioned, there’s Kyrie’s son who died, and there’s Natsuhi who might had a son after all.. is Eva next in the list? Whether this person is Natsuhi’s son or not remains to be seen but here the thing. In EP1 they mentioned how Natsuhi had trouble getting pregnant so her having a child aside from Jessica herself sounds fishy unless the problem was with Krauss and not her. Plus, I’d think she’d actually remember something about that. Maybe she didn’t exactly have a ‘son’ but she gave ‘birth’ or she initiated something that gave birth to something else? This person might’ve considered Natsuhi a mother and felt betrayed for something she did back then. Thunders and a rainy day? I’m thinking this is like when Shannon broke that mirror that protected Rokkenjima. Is this her sin? At any rate, I’m more than sure this ‘X’ person will play a big role in this mystery.